PAINTING WITH A PURPOSE HAS BEEN POSTPONED TO A LATER DATE. PLEASE CHECK BACK SOON FOR AN UPDATED TIME AND LOCATION AS WELL AS REGISTRATION INFORMATION. Moms and Kids of all ages come and join us for a painting with a purpose party! Our preschool hallways look a little bare and need some personalized art. Join us Saturday, June 9, from 9am to 11am at the church to paint and share some snacks. Register now to save your spot and supplies will be waiting for you that morning. Immanuel Summer Kids Club is a 3-day interactive discipleship experience for kids entering kindergarten through 6th grade. The theme this year is "PROOF Pirates." During the week, kiddos will explore the amazing nature of God's grace. Along with an interactive Bible study, the club will offer crafts, music, games, and a tasty snack. This is a great opportunity for your kid(s) to learn about Jesus, make new friends, and have a blast! During the summer, we take a break from our normal rhythm of meeting in homes for gospel communities, and for 8 weeks we gather at the church for EQUIP. EQUIP gives us an opportunity to press into important topics together as a church family in order to learn and grow as disciples. This summer we are going through the book “Life Together” by Dietrich Bonhoeffer. It’s going to be an incredible study! Please join us on Wednesday nights beginning June 20th as we unpack what it means to live in Christian community. Parents! Enjoy a night out on Saturday, April 28th from 5pm to 8pm as we take care of the kids for you! We will have a night full of activities planned for your children at the church building, while you adults enjoy some time out on the town. Click the RSVP button to sign your kids up! Being new to a church can be intimidating and challenging, especially when it comes to meeting people and getting plugged in. Our hope is that everyone who finds their way to Immanuel quickly feels at home and comfortable among our family. To that end, we'd like to invite you to join us on Sunday, May 6th from 6:30-7:30pm for dessert and coffee with some of our members and leaders. This is simply a time to casually connect, ask questions, and find out more about us. Immanuel 101 is a class designed to give you a clear picture of Immanuel Church: who we are, why we exist, and how we live on together as church family. On Saturday, April 14th, we are offering a 101 crash course from 8:30-11:30am. Whether you are simply interested in finding out more about the church, or in taking a formal step toward covenant membership, this class is for you! Sign up by clicking the button below. If you are interested in membership, this is the first step in our process. Or, if you just want to find out more about us, c'mon! You're invited too. So maybe you are newer to Immanuel, or maybe you’ve been around a while but for whatever reason have not plugged into a Gospel Community. Either way, you are invited to our GC PRIMER launching February 11th! This class is a 10 week exploration of the purpose, practices, and rhythms of living in gospel community. In it, we will discuss and then try to implement what it means to be a disciple of Christ called into community with other believers, living to know Jesus and to make him known. So, if you are not plugged into a GC but would like/need to be, or if you are simply curious and want to find more about them, this class is for you! CBR stands for Community Bible Reading. 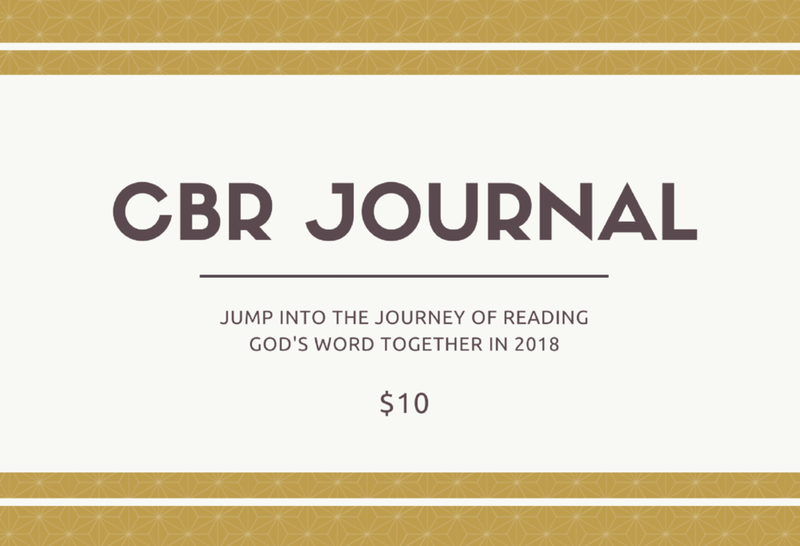 CBR journals offer a way for us to read though the bible together as a church family. These journals provide a structure to help you read through the scriptures, process what God is saying, how you need to respond, and what you need to share with others. They are a huge tool for growing in Christlikeness! Jump into the journey with us in 2018! Be sure to secure your copy for $10 by clicking the button below.